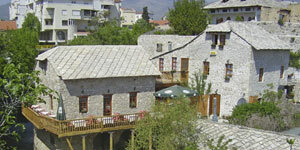 Hotel Kriva*** is located in the old town of Mostar. 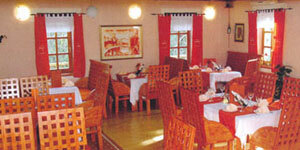 It has been renovated recently (2006) and offers to his guests all facilities which are needed to make their stay comfortable. The Hotel has been built in 1998 and renovated in 2006. Part of the hotel is a big restaurant with 60 places inside and 130 places outside on the terrace. 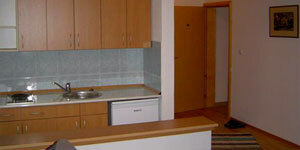 There are 7 rooms and 3 appartments to rent. 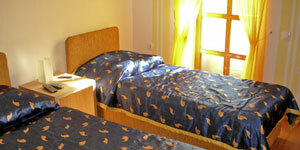 Every room / appartment disposes of aircondition, minibar, sat.-TV, room srvice, bathroom with shower and balcony. Moreover there's the possibility of transportation service with driver or rent-a-car as well as massage service. Pansion Lombrelle is located in the centre of the city of Mostar, only a few minutes away from the famous Old bridge, the symbol of Mostar. 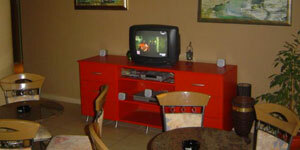 All 8 appartments are well equipped with satellite TV, DVD player, air condition, bathroom with shower and balcony. There's a coffee bar where you can get all alcoholic and nonalcoholic drinks. As well we offer you to use internet cafe with four computers and ADSL-connection. * All prices revised on 1st of march 2006. Prices may vary during high- or off-season.